What's the hunting like in Ontario Canada's Heartland? Moose, Bear, Deer, Wolf and small game hunting are all big stuff in the Patricia Region and hunters can expect to experience a high quality hunt. Deer hunting has become the number one big game hunt in Ontario Canada with bear following a close second. Both animals are abundant throughout the region and many trophy bucks and bear are taken each year. Moose hunting is still a very sought after experience but due to limited tags, it may be necessary to book one or two years in advance to ensure you get a tag for that bull of a lifetime. "Make sure you know the hunting regulations" says the Ontario Ministry of Natural Resources (MNR). They release updates of the hunting regulations in the spring each year. 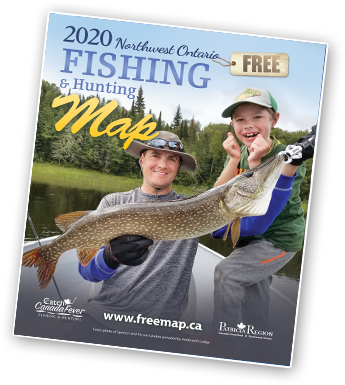 You can either pick up a hard copy of the hunting regulations by stopping at the local Bait and Tackle stores or the local MNR office. If you are interested, take a look at some details online on Ontario Hunting Regulations. There are also some Hunting Tips and Articles on this site to help you get started on planning your Great Canadian Hunting adventure. Don't forget to read and share all our Hunting Articles. When making a hunting trip to North Western Ontario (Canada's Heartland), you should always make reservations in advance to ensure that you have a place to stay and the required tags and permissions for your species of choice. Most hunting lodges and outposts book up well in advance of the season so we suggest you book your accommodations as soon as you have your trip dates setup. For moose hunting especially it may be necessary to book a year or two in advance. Our website has everthing you need to find the best hunting lodge or hunting outpost for you and your hunting party. You are allowed to bring you personal long guns and bows to Canada for the purpose of a hunting trip, however, hand guns are prohibited. There is a registration requirement when you cross the border into Canada which entails a modest registration fee. Read our firearm info page for details on temporary importation of firearms into Ontario Canada. CanadaFever.com is a Canadian Fishing & Hunting specialized chat forum (featuring hunting and fishing reports for the Canada's Heartland area) Here hunters and fishermen are able to exchange experiences and share insights with each other as well as read what the latest hunting has been like in the Patricia Region. Click here to visit the hunting forum on CanadaFever.com. Bear, Moose and Deer are the most popular types of big game hunting in Northwestern Ontario. There are also a limited number of wolf hunts. These hunts take place every fall, and a wide range of hunting outfitters offer guided hunting adventures to ensure your success. Duck and Grouse are Northwestern Ontario's primary small game hunts. Both take place in the fall, making it a perfect time to combine a small game hunt with a fishing vacation. Set your sights after ruffed grouse, spruce grouse & sharp-tailed grouse. Or if you're a duck hunter our region is populated by mallard ducks, black ducks & canvas-back ducks. Hunting any of these species makes for an excellent adventure! You must have a valid hunting license in order to hunt in Canada. Do not forget to bring your license! Jump to our hunting regulation page for detailed information regarding Ontario Hunting Regulations.